Breakfast in Paia is a favorite thing to do whether you’re kama’aina (local) or a guest.There are plenty of fine eating establishments to be found here. Serving locally grown coffee, fabulous crepes, outstanding omelettes, unbelievably good burritos, (and let us not forget about the amazin’ down home cookin’), is all par for the course in Paia. Shopping is a special event in this little hippy enclave. Every sort of unique trinket, wearable art, gag gift, cool clothing and funky furniture can be found here. “Unique” is the only word for Paia and if you’re into art, food and genuine Hawaiian island products as well as other finds from around the globe… you won’t be disappointed. Off-the-beaten-track style galleries, boutique clothing and jewelry stores abound here. If you’re into amazing and unusual, this is definitely a stop not to be missed! Many times visitors to Maui come for more than just the beaches. They come for… the waterfalls. The problem is that there are very few that are safe to swim under due to flash flooding and the inability of authorities to warn people fast enough. If you’re looking to safely take a dip under a picturesque waterfall (or series of them), it’s well worth a quick 15 minute drive south on Highway 31 from Hana to the Pools at O’heo Gulch (Mile Marker #42), located in Haleakala National Park. Admittedly, the Pools of O’heo are a popular destination. And, why not? They’re known worldwide for their beauty, accessibility and safety, (these swimming pools are constantly monitored for flash floods). Don’t go just for the pools, though. O’heo Gulch offers more than floating about under a “dream come true waterfall”. Hiking through the bamboo forest is quite amazing as well. Bring the bug repellent though, it’s a necessity in the jungle. As always, before you embark on your journey to the Pools at O’heo, be sure to check weather conditions at the pools. f they are closed, check back in an hour or so. It’s not uncommon that floods will occur in the morning but by afternoon the pools are open. Then there is the camping. Perhaps some of the best views to be had on Maui can be found here. Be prepared for rain, because it does do that often. After all, you are in the rainforest, right? The now famous Ke’anae, a traditional Hawaiian village inhabited by Hawaiians modern times, sits upon a lava finger that pokes out into the middle of the Pacific at Mile Marker #16 just off the Hana Highway. It is a great little cultural stopover on your tour of Hana. This peninsula was actually formed in more recent times from lava flowing down from Haleakala, but amazingly, the soil was brought down from the mountain by hand. Basket after basket of soil was hauled down to create the fertile fields we see today. Aunty Sandy’s is known throughout the islands for her banana bread being oh so moist and delicious. But, the shave ice, kalua pig burger and fruit are also some of the best on the island so don’t miss stopping in to have a little treat…. or lunch. The Old Stone Church holds services for all who wish to attend every 3rd Sunday. There is NO SWIMMING OR WATER PLAY here due to the jagged coastline, but don’t worry, with this kind of foodie fun you won’t even be thinking about it! Get out the camera! There simply isn’t a more majestic, easily accessible and photographable waterfall on Maui. It’s just a bit of a drive to get to, but it’s completely worth it. Be mindful of the weather however, flash flooding does occur and can be a bit overwhelming when trying to get a good shot of this roadside colossus. As with most things, timing is everything. At 100 feet it is one of the largest along the road past Hana and definitely the easiest to photograph. It’ a pleasure to behold and the photos will be the envy of everyone at home. If foodie fortune is on your side there will be locals selling their wares, and banana bread should be at the top of your “musthaves” list for Maui. It’s moist and delicious so don’t forget to buy a few loaves for snacking and the return ride home! Palm weaving is also another local trade. Weaved baskets, hats, placemats, ornaments, boxes and more are usually available if the vendors are there. Maui has exceptionally talented weavers and artisans. 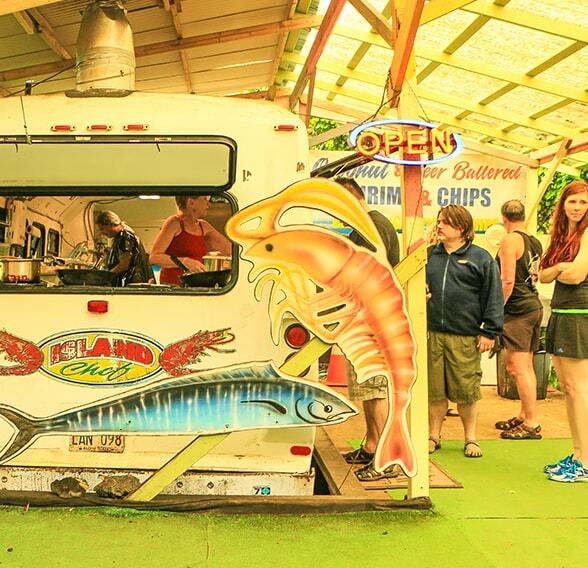 Mile Marker #29 is where it’s at for shopping and eating on the road to Hana. It’s a wonderful stopover and if you’re a foodie you’ll be pleasantly surprised. The Nahiku Marketplace is also a great spot to shop from local vendors. You can always find something unusual that is just calling you to take it home. It’s also an area known for it’s amazing scenery. Walking in this area is appealing due to it being quiet and pretty pristine. A walk through the rainforest will bring you past the Nahiku Treehouse and waterfalls and there are views, views, views! 360 of fabulousness awaits you just off Mile Marker #32 at the Wai’anapanapa State Park. It’s a”must do” on any road to Hana trip. It’s important to realize that this is a popular destination so it’s necessary to reserve a campsite or cabin rental months in advance, especially during peak season. That said, this may be the best black sand beach in Maui. It’s rich, dark color comes from it’s origins… lava rock that once spewed forth from Haleakala. But remember, it’s darker color attracts and absorbs the sun’s rays, so a good sunscreen and footwear are a MUST ! Swimming (at designated locations) and sightseeing are primo at this spot and don’t forget to bring a pole for some serious shore fishing! And then there’s the Kipapa O’ Kihapiilani Trail. It can be a challenging at times 2.75 mile round trip hike because the trail is old, a bit strenuous, but well kept. The payoff is that the views are amazing. And, if you go far enough, the area between Pailoa Bay and Pakaulua Point is ancient and a part of the Hawaiian King’s Highway. Whether it’s island style shopping, enjoying a leisurely lunch or taking in a Hawaiian history lesson at the Cultural Center, the town of Hana doesn’t disappoint. ( Just remember that places close early and may have unusual hours of operation so be sure to check .) Lunch is always a bit of an adventure in Hana. And remember, you’re in Maui so it’s advisable that you get on Maui time to truly enjoy the experience. So, when in Rome… as the old saying goes! Now for those who haven’t yet made, or inherited, a fortune and/or find themselves under time constraints, there are more casual, affordable restaurants for a less formal, still fantastic, and likely faster, feast. The mighty rain shadow of Haleakala is the cause of the parched prairies found in Kaupo. The wet season is short here, regardless of what else may be happening on the rest of the island. Because it’s on the leeward side of the island, gale force winds are nearly commonplace here. You will see cattle grazing on the grass, when there is grass, but other than that it’s rocky and windy with some amazing, wild, desert-like views thrown in for good measure. It really is like scenery out of a movie. And, there is the quirky and funky, but fun, Kaupo Store. Serving some fantastic sandwiches and local treats to tantalize your tastebuds is their mission and they definitely have achieved it.